● Their website offers a low price membership. Once you become a member, you can download everything on their website without limit, which may be cheaper than buying everything individually if you are an avid user of the site’s products. ● Check out the Free Stuff section for free sheet music, manuscript paper, apps and more. ● The store offers a safe and easy shopping guarantee; see this page to learn more. 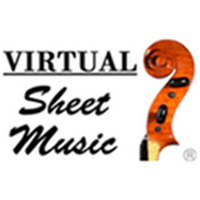 Virtual Sheet Music offers sheet music for a full range of instruments and vocals. Users can search for sheet music by using the A-Z menu on the right hand of the homepage or they can click on the particular instrument which are listed at the top of the homepage. There is a scrolling banner that users can click on that has items like “wedding sheet music”. The sheet music is downloaded as a PDF file with MP3 files. The cost varies depending on the sheet music but there are many options starting at $4.99. Users are required to create an account. For most up to date offers check out Virtual Sheet Music on Facebook and Twitter or contact Virtual Sheet Music Support for any questions.